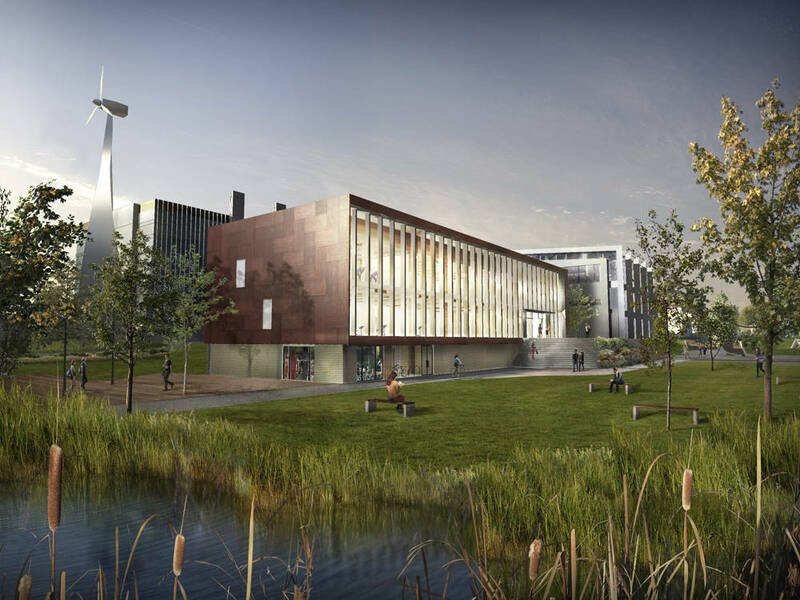 The Sky Health and Fitness Centre came about through collaboration between BSkyB’s headquarters masterplan redevelopment team, and dRMM with Arup’s on-going research into sustainable engineered timber construction. As a demonstration of their commitment to the health and wellbeing of staff at their bourgeoning West London campus, Sky commissioned dRMM to design a purpose-built staff fitness centre. When dRMM was selected to design its successor, the existing campus gym had been operating for over 14 years and was seen as a key staff amenity, central to the organisation’s ethos of maintaining a work/life balance and engendering a healthy lifestyle for their employees. The existing gym suffered from being over-subscribed and was in a poor state of repair. 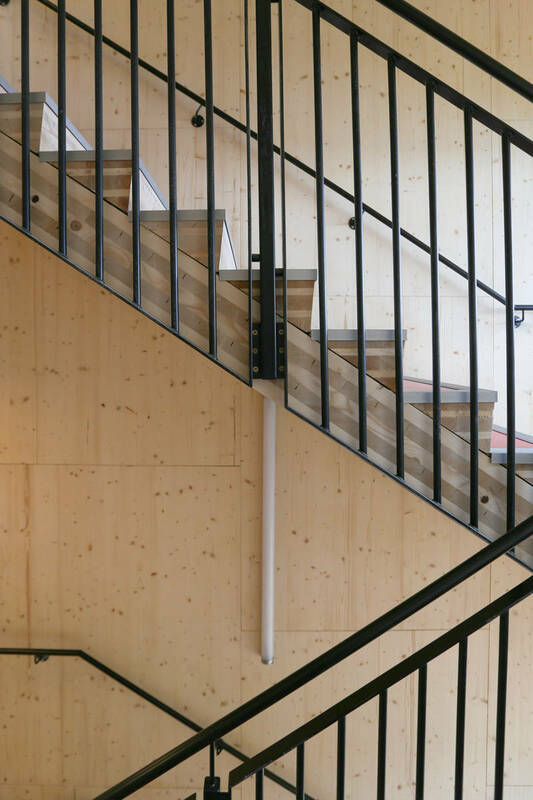 dRMM’s aim was to create a building that would embody Sky’s corporate sustainability policies whilst building on our own studio research into innovative structures and modern methods of construction using sustainable materials. 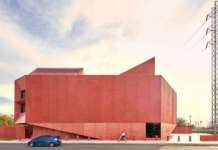 The result is a building that is entirely naturally lit, made almost entirely of engineered timber and glass, and finished with natural and recyclable materials throughout. 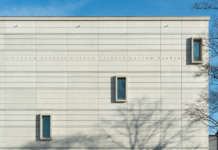 The Sky Health and Fitness Centre represents a strategic building, in connection with the future masterplan developments. 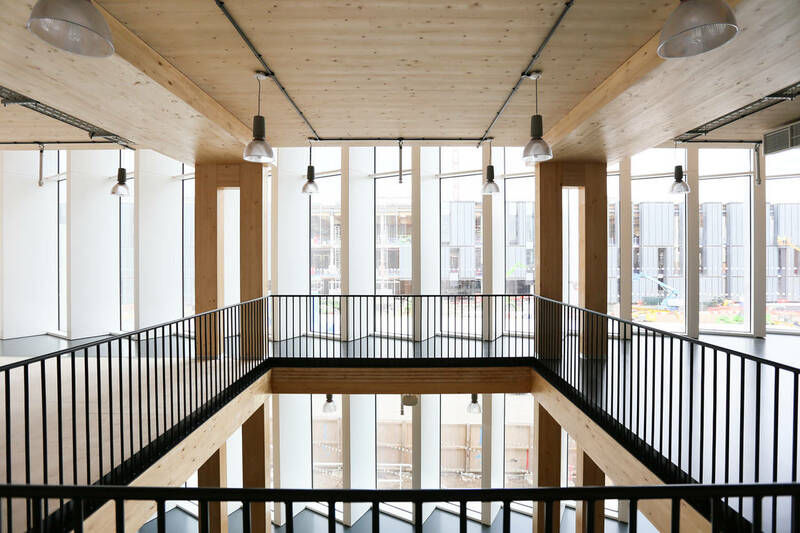 The building is composed by an original arrangement of laminated ‘bifurcated’ timber columns and cross-laminated timber (CLT) walls and floors as an hybrid flat slab/beam structure. Conceived as a simple, elevated open-sided box, the building’s elongated glazed western façade takes advantage of views and daylight penetration. To avoid overheating, this façade adopts a corrugated profile like an out-stretched accordion; with glazed panels facing due-north and solid insulated panels facing due west. 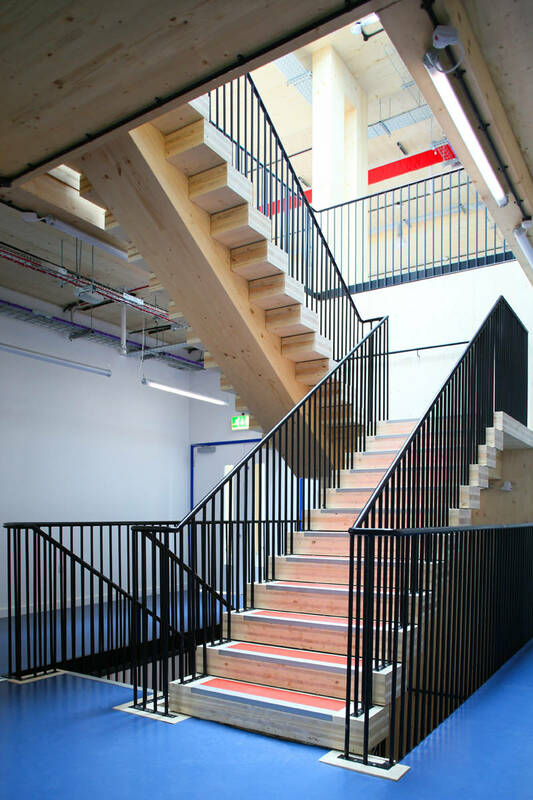 The building comprises three levels, with a semi-underground basement containing changing rooms and a cycle shop/workshop. 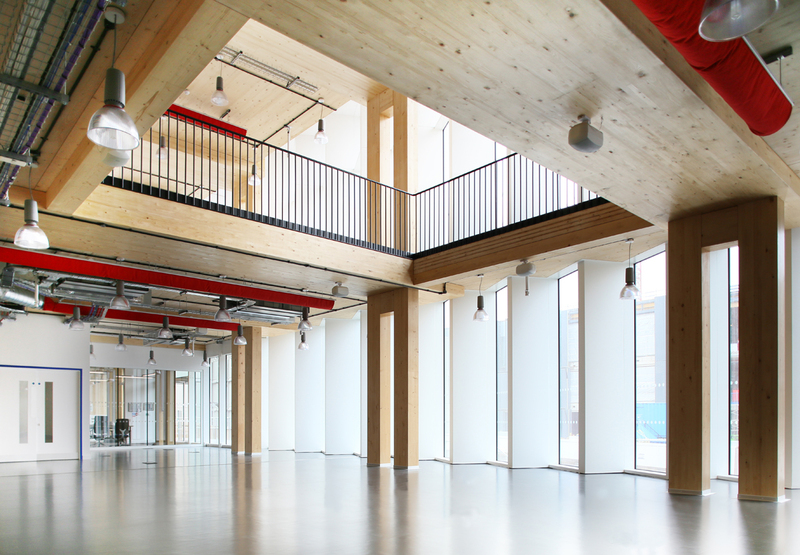 The ground floor, entered from a raised landscaped terrace comprises the main building entrance and fitness gym spaces, whilst the top floor provides aerobic /yoga studios and consultation rooms. 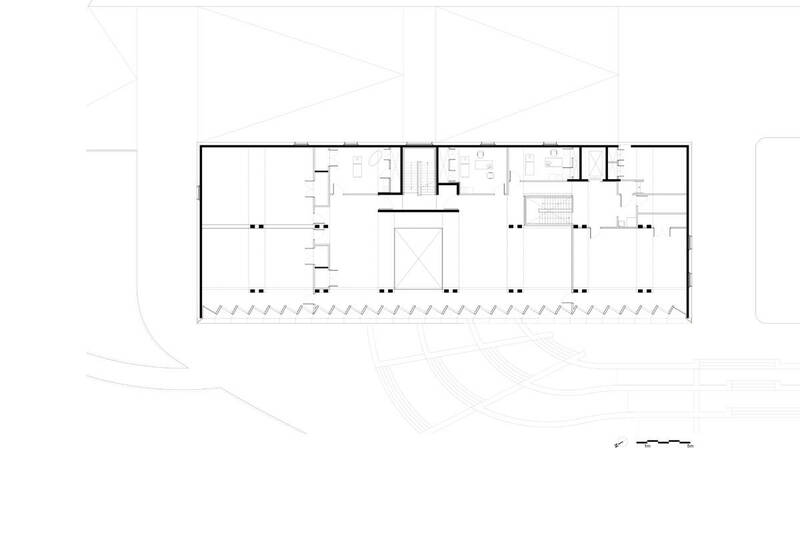 The basement works as a concrete plinth supporting the raised sculptural timber and glass box. 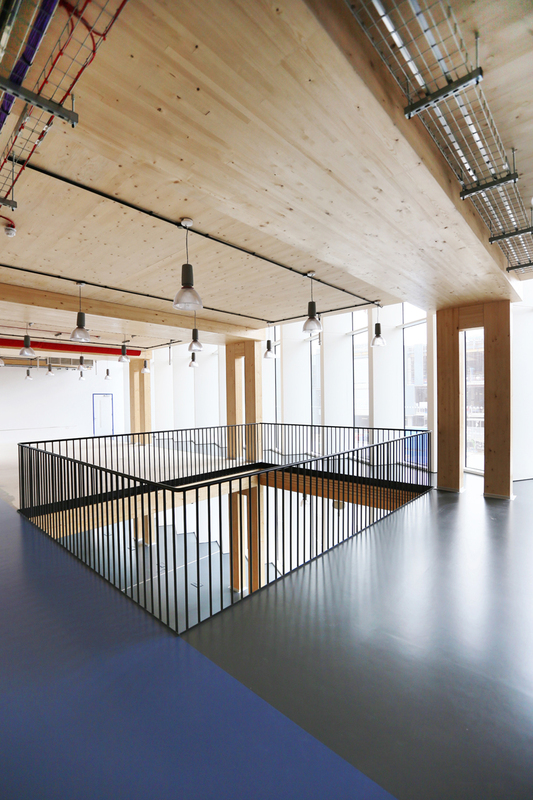 A structural timber stair of cross-laminated treads connects the three floor levels illuminated by a rooflight – clouds visible as they pass overhead. The building operates 24 hours a day. 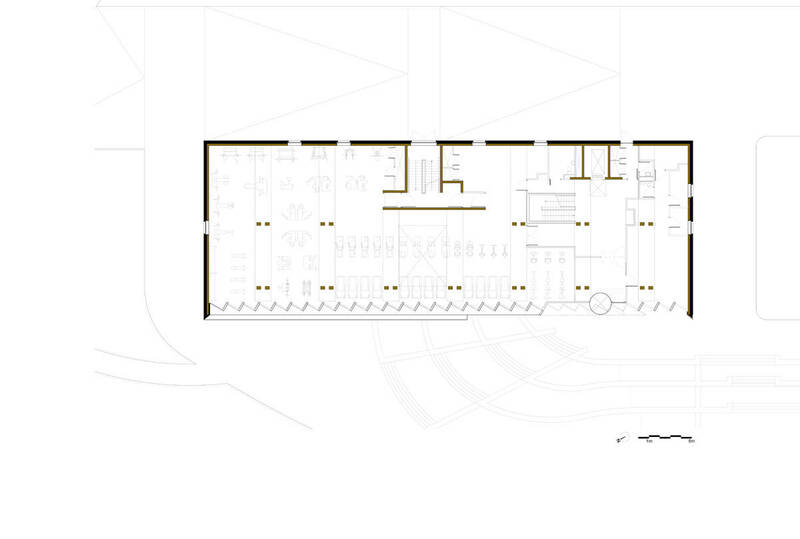 In the design stages, dRMM identified the importance of visual connections through the building as a means of providing a sense of openness and passive surveillance. To this end, a central void connects the first and ground floor gym spaces whilst allowing natural daylight deep into the plan. In a single powerful move this large ‘hole’ in the building also reveals the didactic, inventive structure and construction logic with a spectacular space, showing the embodiment of the natural and holistic aims of the building’s use. Designed and delivered in just 17 months – with the timber superstructure taking only 26 days to erect, dRMM are proud to have produced a building which testifies to the beauty, versatility and efficiency of engineered timber, and which offers outstanding facilities for the well-being of the Sky workforce.